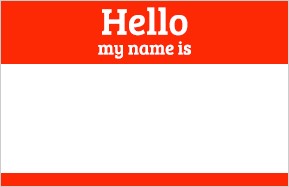 This article will show you how to edit the premium versions of our name tags. If you want to try this before buying, we have a free sample to download here. Please note that only the content of the text is editable. It isn't possible to change the font, color, etc. Download the file by following the link in the email you received. Open the PDF file in Adobe Reader. Other PDF readers may work, but we have noticed inconsistent results with things like fonts, so Adobe Reader is recommended. Download Adobe Reader if you don't have it installed. Make sure you uncheck the option to install additional software so Adobe doesn't add unwanted programs to the installation. Repeat the process for the rest of the name tags. 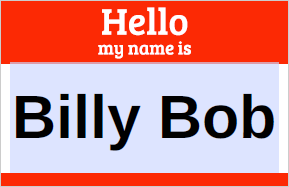 You can move from one name tag to the next by hitting the Tab key on your keyboard. If you prefer, you can also select each field with your mouse. 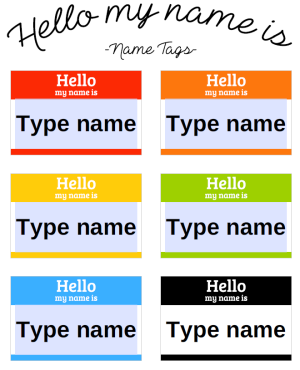 If you need more than six name tags, you may want to create enough copies of the original file to accommodate the number of tags you require. Each copy can be saved after editing so you have an original copy with the names. This will prevent you from having to create the name tags again if you have a typo or need another printout of the tags. The highlights for the editable fields won't print. They are shown in Adobe Reader to identify an editable form field. 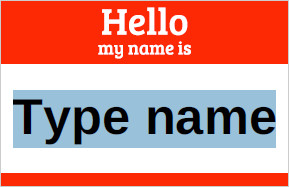 If you want to write names by hand instead of typing them, delete the "Type name" text before printing for blank name tags.